Abstract: Objective To investigate the expression of deleted in breast cancer 1 (DBC1) in small cell lung cancer (SCLC) and its correlation with prognosis.Methods The clinical data of 73 SCLC patients who underwent surgery in Shengjing Hospital of China Medical University between December 2009 and June 2013 were retrospectively analyzed. The expression levels of DBC1 in lung cancer tissues were detected using quantitative real-time polymerase chain reaction (RT-PCR). The correlation between the expression of DBC1 and the clinicopathological parameters of SCLC patients were analyzed. 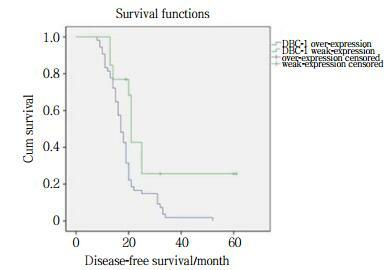 The Kaplan-Meier method was used to analyze the relationship between DBC1 expression and survival of the SCLC patients; independent factors of prognosis were analyzed using the Cox proportional hazards model.Results The expression of DBC1 was significantly associated with recurrence and metastasis (P < 0.05), whereas it was not significant correlated with the patients gender, age, pathological type, stage, and smoking history. Results of the Kaplan-Meier analysis showed that survival rates were significantly decreased in patients with higher DBC1 expression levels when compared to those with lower expression levels (P < 0.01). 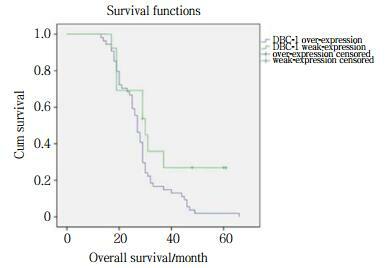 Cox proportional hazard model analysis showed that the expression of DBC1 can be used as an independent factor for the prognosis of SCLC patients.Conclusion High expression of DBC1 is correlated with recurrence and metastasis of SCLC, and associated with poorer prognosis in SCLC patients. LIU X, EHMED E, LI B, et al. Breast cancer metastasis suppressor 1 modulates SIRT1-dependent p53 deacetylation through interacting with DBC1[J]. Am J Cancer Res, 2016, 6(6): 1441-1449. WON KY, CHO H, KIM GY, et al. High DBC1(CCAR2) expression in gallbladder carcinoma is associated with favorable clinicopathological factors[J]. Int J Clin Exp Pathol, 2015, 8(9): 11440-11445.